Providing you the best range of cable tie with effective & timely delivery. 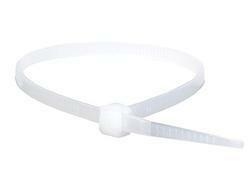 Ties Consisted of a toothed nylon strip with a one-way ratcheting hole at one end. Easy to use; simply zip and snip. You slide the pointed end into the hole and pull it tight, but it will not loosen up Used widely bundling interior connecting wire of TV set, computer, home appliances, lamp decor, electric toy,etc.